Jordan Lemon made a happy return to his former club as Spalding United took top spot. A fifth successive win lifted the Tulips into pole position, making it a happy new year. Lemon’s goal came with 15 minutes left to complete the league double over Stamford. Top scorer Bradley Wells took his tally to 20 so far this term, cancelling out Jamie McGhee’s opener. Spalding got what they deserved in the end with a dominant second-half display – proving yet again they know exactly what it takes to pick up points in this league. As boss Dave Frecklington has been saying since he came to the club last summer, it’s not pretty but it’s effective. The first period was what you would expect from a local derby – plenty of effort and not much quality. Stamford went ahead as Courtney Meade delivered a lovely cross which McGhee met with a diving header inside the near post. That was the first goal Spalding had conceded in 390 minutes since left-back Adam Jackson returned to the defesive unit. First-choice goalkeeper Michael Duggan was forced to watch due to a knee injury but Sam Vince wasn’t tested on his debut. With skipper Nathan Stainfield on top form again, Vince had plenty of protection after that early setback. It could have been worse for the Tulips as home captain Jordan Smith nodded wide from Jake Duffy’s cross. Six minutes later, it was all-square thanks to another close-range finish by Wells. 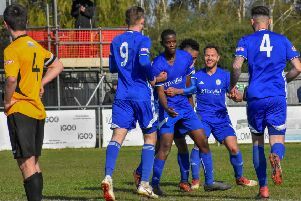 The striker – who got both Spalding goals in the home win over Stamford in August – was in the right place at the right time as Stainfield got a touch on Lemon’s free-kick. Meade’s drive deflected off Jackson but at the other end Matt Varley should have done better with a header from Conor Higginson’s corner. In first-half stoppage-time, Brad Barraclough went past Kern Miller but saw his shot kicked out by Sam Donkin. Wells wasted a glorious chance to put Spalding in front five minutes after the break. Higginson found him on the edge of the six-yard box but the left-foot volley was kept out by Donkin. Although the keeper deserves praise, it was a bad miss. As the Tulips took control, Higginson’s free-kick was punched over the bar and Wells flicked a header wide. Wells and Barraclough combined as Lemon raced into the box and beat Donkin from a tight angle for what proved to be the winner. There was no way back for Stamford as the Tulips closed out the rest of the game for another impressive victory. 4-4-2: Donkin; Gordon, Miller, Salt, Luto (sub Brown-Hill 77 mins); Smith, Murphy, Duffy, McGhee (sub Nodder 90 mins); Ryan, Meade (sub King 70 mins). Subs not used: Challinor, Hartley. 4-4-2: Vince; Walker, Spafford, Stainfield, Jackson; Lemon, Varley, Whitehead, Higginson (sub Field 79 mins); Wells, Barraclough (sub Lockie 85 mins). Subs not used: Wightwick, Fleming, Duggan. McGhee (16 mins, 0-1); Wells (25 mins, 1-1); Lemon (75 mins, 1-2). Ryan (foul); Meade (kicking ball away). Bradley Wells – another goal and a terrific display up front, leading by example again.